If you are in a mood to indulge in an after-dessert or just because you have a sweet tooth, hop on to this place for scrumptious waffles and much more. 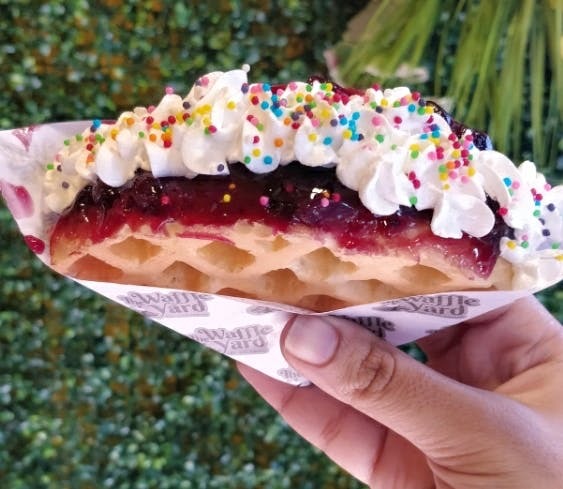 The Waffle Yard serves two kinds of waffles - 'waff-wich creations' and 'bubble creations'. Also if you're getting it packed, a quarter waffle is cut out and placed in a convenient paper bag so that you can stroll around without having to worry about the cream dripping. Definitely, recommend you try the 'berries and cream' and 'blissful berries' at this spot to satisfy those cravings. It's a compact place fitting around 5 people at a time so prefer a takeaway or prepare to wait until the seats are emptied. Definitely, the seating arrangement is a downside, too small to be comfortable. The menu is limited to eight variants and a couple of finger foods to finish off the sweetness with.